Leaders of both groups vow to 'liberate all of Palestine' from Israel despite 'unity pact' agreement to renounce terrorism. Both Hamas and Islamic Jihad reiterated their commitment to terror over the weekend, stating that a "unity" pact with the Palestinian Authority (PA) and the new government's public pledge to renounce terror does not change their views. Hamas leader and former political figure Ismail Haniyeh stated in a public address Saturday - in honor of the opening session of terror training "summer camps" in Gaza - that "Hamas's strategy has not changed and will not change." "Wherever [Hamas] presides, we will remain preachers and teachers and build the Palestinian nation to liberate all the land of Palestine," Haniyeh said, referring to the entire land of Israel. "We emphasize now that we will not retreat from out plan to liberate our lands and ensure the right of return and the release of [terrorist] prisoners." 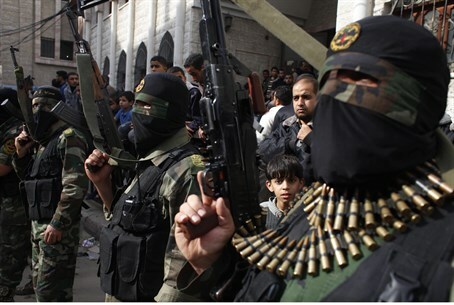 Islamic Jihad, similarly, ignored calls from Israeli Defense Minister Moshe Ya'alon to disarm due to the pact. "Weapons [of resistance] will remain in our hands [. . .] in order to liberate all of Palestine," Khaled Al-Batesh, Islamic Jihad leader, stated to Hamas-backed Palestine magazine Sunday. The US and EU have largely predicated its willingness to "work with" the new unity government on the misnomer that the government does not actually include Hamas politicians. PA Chairman Mahmoud Abbas has insisted that a 'unity' government would be based on what he called"the four Palestinian principles": recognizing Israel, recognizing the terms of international agreements, and the explicit rejection of violence and terrorism. Despite this, Hamas announced that any "unity" government would be unequivocally subject to their approval before being established - and analysts say that both Hamas "ministers" and Islamic Jihad terrorists are expected to join the government soon. Indeed, three Hamas-backed ministers were sworn in to the new government from Gaza on Monday via video feed.